Engagement rings and wedding bands are culturally important. They have thousands of years of tradition and are rich with symbolic meaning. Even the finger on which they’re worn has significance. On a personal level, diamond engagement rings and diamond wedding bands are a sign of deep and enduring love. In choosing a ring, you want something that’s compatible with your heart. Settings, also known as mounts, are what unite diamonds and engagement rings. They hold diamonds in place, securing the jewels to the band. Depending on the mount, they may serve decorative purposes, adding a touch of color or texture to diamond bands, or other visual flourishes. Certain settings also help to protect diamonds from accidental chips or other damage. The custom of wearing engagement rings to mark an upcoming marriage is an ancient one, dating to the Roman empire and possibly earlier. 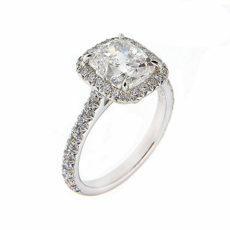 As centuries passed and aesthetics tastes changed, so did the appearance of engagement rings. 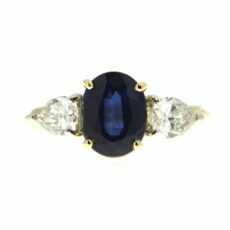 One of the most significant innovations to engagement rings was in 1477, when the first diamond engagement ring was introduced. Diamond bands then became popular with the upper crust. 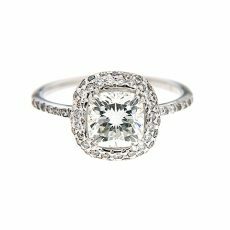 Diamond mine discoveries in Brazil, South Africa and elsewhere increased the availability of diamonds, making diamond engagement rings accessible to a broader range of people. 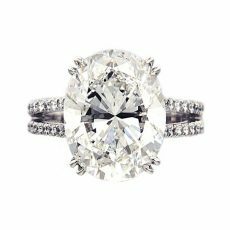 When choosing a diamond engagement ring, there’s a lot to keep in mind. It’s a ring meant to be worn daily, and should be of a style its wearer enjoys. At the same time, engagement rings are a symbol of the bond between a couple. Its design should reflect the love they have for each other. Diamond engagement rings are worn on a high traffic part of the body, leaving it vulnerable to bumps and other accidents. 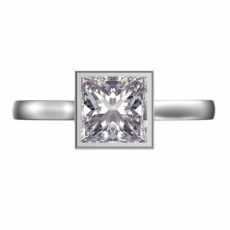 It’s important to select diamonds and other gemstones known for their durability. However, no jewel is invincible. Gemstones should be set in a way that protects them from harm. 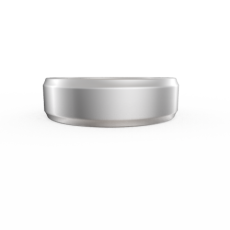 Wedding bands are a tangible sign of a loving, committed relationship. The practice is centuries old, but for most of that time, only women wore them. 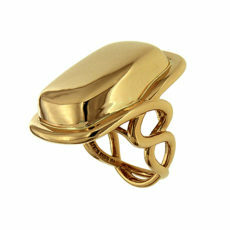 By the 20th century, both men and women donned the rings. Carat is a unit of measurement which gauges weight. In the jewelry world, it determines the size of gemstones. One metric carat is equal to 200 milligrams, or a fifth of a gram. 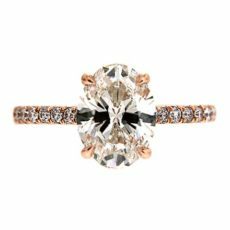 The search for unique engagement rings can mean turning to the most cutting-edge designs. It can also involve turning to older jewelry designs and giving them a new twist. Different periods embraced various diamond cuts, precious metals and band styles. Searching for your ideal diamond engagement ring or wedding band may introduce you to new vocabulary. Some terms such as “gold” may be clear, but others like “setting” and “mounting” can get confusing. Knowing the parts that make up a ring, may make shopping easier. 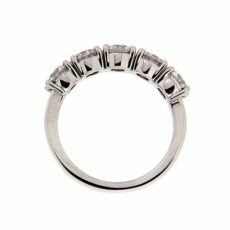 The term “finish” means a couple of things in regarding diamond bands. One refers to the diamond itself. Skilled polish and symmetry can make a jewel extraordinary. Finish as it applies to precious metal influences its surface appearance. This can be anything from a textured matte to a smooth gleam. Both types add to the ring’s beauty. Getting married is a landmark event in a person’s life, uniting them with a loved one with a bond recognized by one another, the state and society. For thousands of years, married couples have worn rings on the fourth finger of their left hands as a sign of their union. While the tradition of wearing wedding bands has endured, the styles, materials used and other matters have changed with time and place. On television, magazines and elsewhere, people wear diamond bands on one finger each. Stackable rings are coordinating pieces designed to be worn one on top another. 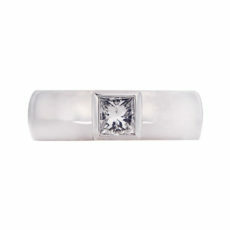 These rings are often on the thin side for ease of layering, but come in many widths. There is nothing more exciting in jewelry fashion at this point than creating your stackable rings. Stackable rings came in as an inevitable product of jewelry layering and one of the most distinguished styles. 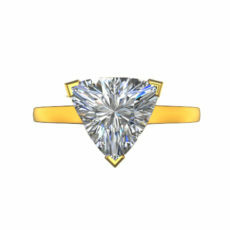 As perfect as a diamond may be for you, it’s difficult to wear until it’s mounted. 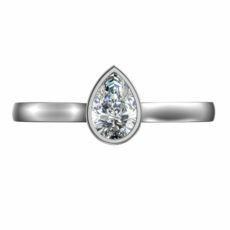 Settings not only hold the diamond in place, it helps protect the jewel from damage, and can decorate the ring. Certain mounts are well suited to holding individual stones, while others are designed to hold several at once. Rings are pieces of jewelry worn around the fingers. They range from miniscule bands to extravagant statement pieces. 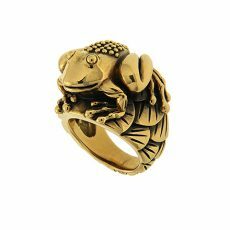 While specific rings serve practical or symbolic purposes, still more are enjoyed for pure aesthetic value. 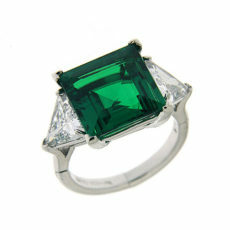 Popular ring materials include glass, silver, gold, platinum and diamonds. A common way to wear rings is one or two on a hand, on separate digits. Stacking, or wearing multiple rings on the same finger, is getting more attention. While it may seem like a new trend, the practice has a long tradition. 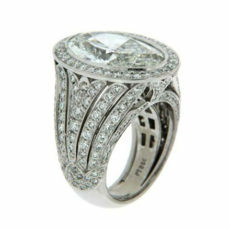 Elaborate diamond rings catch the eye. Extravagant designs can compel a person to keep looking, taking in every detail. Plainer rings may not be as dramatic, but they have their admirers. 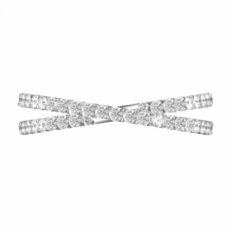 They appeal to those feel the craftsmanship of their diamond bands stands out on their own. Whether they’re engagement rings, wedding bands or other jewelry, if they have gems, they must be secured. Prongs are thin pieces of wire which rise along the sides of the stone and bend over the girdle. 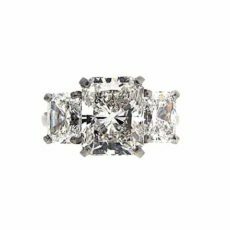 Cushion cut diamonds have been around for centuries, under many names. They were developed to promote brilliance while preserving carat. The advent of the round brilliant overshadowed cushion cuts, but the latter persevered. As with everyday speech, jewelry terms may have more than one meaning. 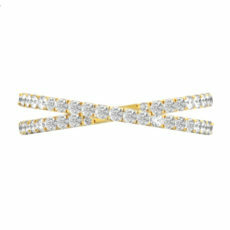 “Diamond bands” for example, may refer to the shank or the entire ring. “Step” also stands for a couple of terms. One is a type of diamond cut. The other is a form of ring embellishment. 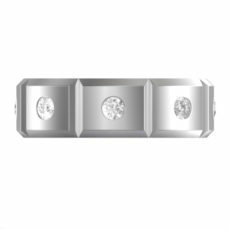 Diamond bands commemorate milestones in a person’s life like weddings, engagements and anniversaries. These rings have powerful emotions and meaning attached to them. When combined with the range of available designs and where to buy them, it can feel overwhelming. When most people think of diamond color, clear jewels come to mind. Most gem quality diamonds have a hint of hue. The Gemological Institute of America grades diamond color on a range of D to Z. D is for the lightest of diamonds and Z with the strongest tinge. Settings are what keeps diamonds and rings together. Metal connected to the band grips the edges of jewels. How this happens depends on the type of mount. Beautiful diamond rings don’t form in a vacuum. 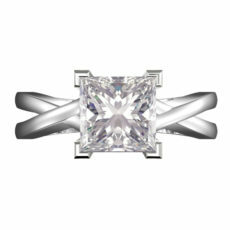 Designer engagement rings, wedding bands and anniversary rings take inspiration from many sources. Some may use color, shape or light as the basis of their overall look. Others may turn to nature, a perennial favorite for unique jewelry. People wear diamond engagement rings as a sign of their upcoming marriage. Afterwards, they don wedding bands. What happens to engagement rings after the wedding depends on individual preferences. The ring may be transformed, worn with the wedding band and other possibilities. Diamond engagement rings, wedding bands and anniversary rings are symbols of love. 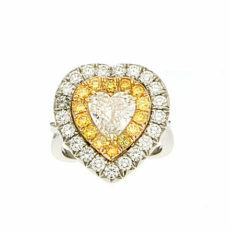 Hearts are considered to be the seat of emotion and sentiment. Generations of couples have worn diamond rings. They’re used to commemorate important events in a relationship like engagements and weddings. It’s not always easy finding the diamond engagement ring of your dreams. Some people know what they want, but have a hard time finding it. 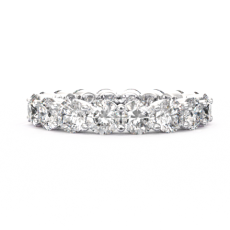 Others may want a greater say in their diamond band than simply choosing a ready-made piece. 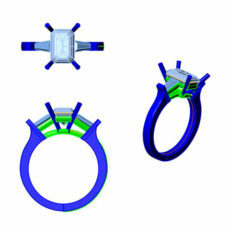 Some jewelers, such as Valentin Magro, offer design-your-own-ring services. 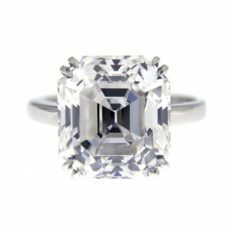 Men’s wedding bands don’t have the flashy reputation of their feminine counterparts. Many companies reserve their flourishes for women’s weddings rings, adding micro pave stones, heart shaped diamonds, or patterns etched into precious metal. Diamond rings are often worn to commemorate life events such as engagements, weddings or years spent as a couple. These rings are often worn on a daily basis as a show of romance. Unfortunately, everyday factors such as dust, fingerprints and others may eventually make a ring less than pristine. 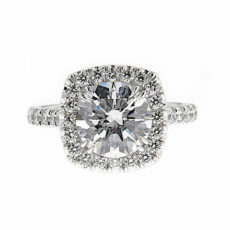 With care and caution the wearer may keep their ring as beautiful as the day they received it. Before the wedding day is the engagement, where people wear rings to signal their upcoming joy. While many are satisfied with traditional diamond engagement rings, others want to stand out. 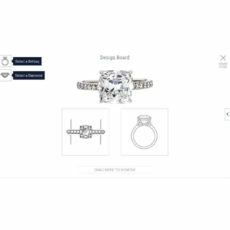 Valentin Magro’s Custom Diamond Collection has a page for creating the band you desire. To make gold strong enough to withstand life as a ring, it’s blended with other metals. Depending on the materials used, gold keeps its yellow. Other recipes cause gold to change hues, which then becomes colored gold. Many diamond wedding bands are designed with women in mind. 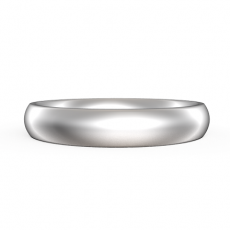 Men who want brilliance on their wedding bands may prefer to wear different styles. Their bands may not receive as much attention as their counterparts, but there are attractive rings available. Diamond engagement rings are rich with meaning. They represent a committed relationship that’s about to grow stronger. Special care goes into shaping the jewels that go into the rings. The band too undergoes many steps before it’s ready for wear. 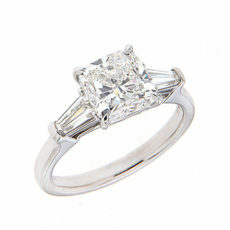 Engagement rings, wedding bands and other diamond rings are made to be as attractive as possible. This means careful attention to quality and design. Many of these bands carry extra significance, marking romantic milestones in a person’s life. Caring for your ring will keep it as beautiful later as it is now. Symmetry is where one half of a shape mirrors another. Some forms like squares have multiple lines of symmetry, while others such as hearts have just one. 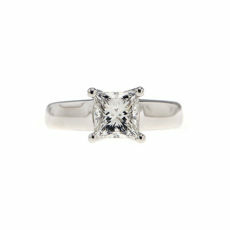 With diamonds, symmetry helps determine if a cut is well made, and influences the stone’s brilliance. Rings themselves don’t have to be as strict. Many diamond engagement rings and wedding bands are sold individually. Wedding sets are two or more rings which commemorate these romantic milestones. They appeal to couples who prefer to ring shop only once. Others enjoy the coordinated look of their diamond bands. Diamonds have remarkable properties. Its chemical composition makes it the hardest natural substance on earth. This same structure allows for unusual reflective qualities. 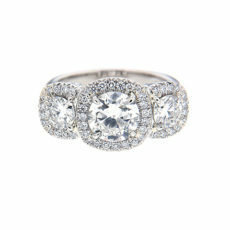 There’s also centuries worth of lore which makes diamond rings all the more special. 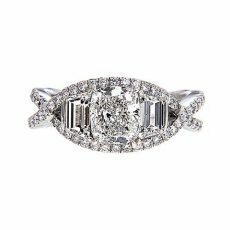 Diamond engagement rings embody the love two people have for one another. Every relationship is different, and some couples want their rings to be as distinct as them. 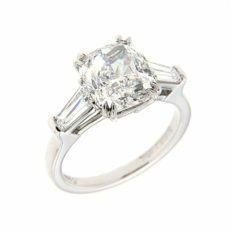 They want diamond rings which reflect what they find beautiful, or designs with special meanings. 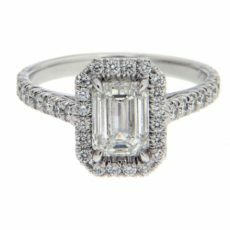 Jewelers aim to meet this demand, finding new ways to create unique engagement rings. 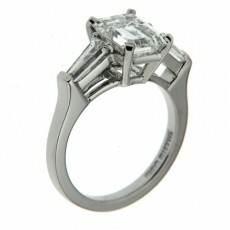 There’s an appeal to seeking out the newest, most cutting-edge designs for diamond engagement rings. Timeless styles are also enjoyable. 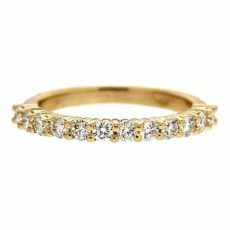 It may be the idea of diamond bands which are always in fashion. There’s also the thought of emulating other happy couples. 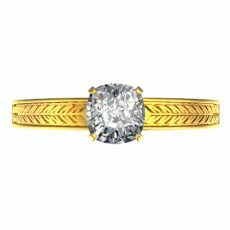 Engagement rings, wedding bands and anniversary rings have a long tradition. For thousands of years, spanning many cultures, rings and love were tightly linked. As time passed, new layers of meaning emerged. 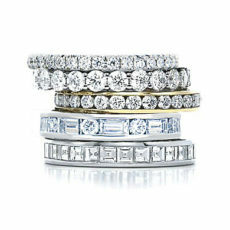 Today’s diamond bands celebrate many aspects of a couple’s devotion to each other. Diamond clarity is one of the Four Cs of diamond quality. It measures the state of the jewel’s crystal, while carat, color and cut determine other factors. The Gemological Institute of America rates clarity on a scale ranging from Flawless to Included 3. Aesthetics may change, but wedding bands continue. The love and devotion they represent is always prized. Women have a longer history of wearing wedding rings. This is reflected in the wide array of designs made with them in mind. 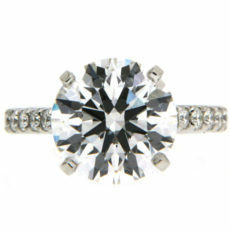 When people think of diamonds, a round glittering stone usually comes to mind. 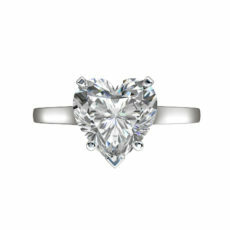 Other diamonds take on whimsical shapes like hearts or pears. 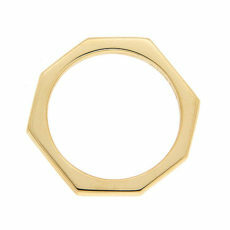 Angular jewels like squares or rectangles are also gorgeous. 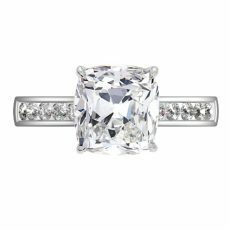 While diamond engagement rings have been popular for centuries, there are more things to consider when it comes to the right style. 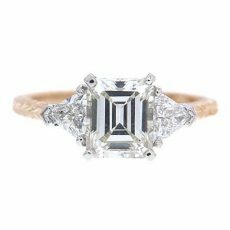 While a number of people find a single jewel on their diamond engagement ring to be all the shine they need, others enjoy some extra brightness. 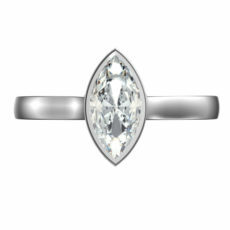 For the latter, side stone diamonds may be just the enhancement their looking for. Since the Roman Empire, women have worn engagement rings as a sign of their upcoming marriage. What used to be iron bands transformed over time into precious metal rings. Gemstones make a frequent appearance, especially diamonds. The desire to have something that is yours and yours alone is a strong one. Engagement rings, wedding bands and anniversary rings are no different. Some people desire unique rings to make a statement or imbue extra meaning to their diamond bands. 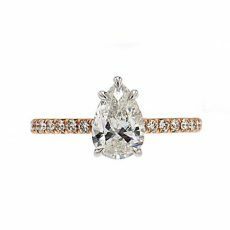 A mixed cut diamond is one that combines brilliance and carat preservation. 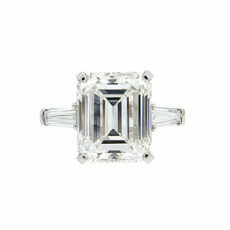 Of these, the princess cut is the most popular. 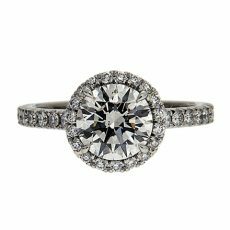 On diamond engagement rings, it comes second only to the round brilliant cut. 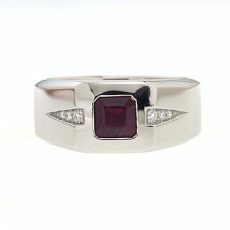 Its shape not only makes it suitable for side stones and central jewels, but also for flourishes like channel settings. In diamond rings, jewels are the center of attention. The band the diamonds rest upon is admired for its gleam and design. 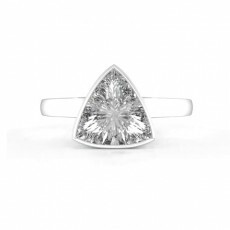 Prongs are a popular setting connecting gems to rings. There are several variations of prongs, each serving a slightly different purpose. 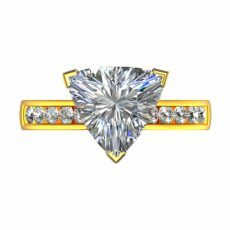 To mount a diamond is to connect it to a ring. Some types are designed to allow as much light to flow through the jewel as possible. 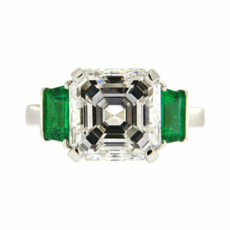 Other diamond rings concentrate on keeping the gemstone safe, and still more are decorative as well as practical. 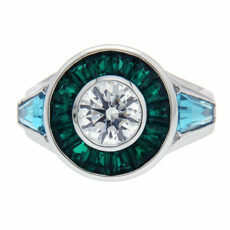 The demand for colorful rings varies depending on trends and individual tastes. Of these hues, yellow is a popular color. It appears in many forms, such as gold. 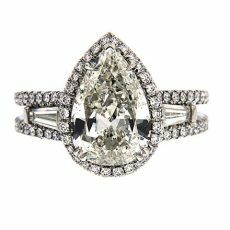 Unique engagement rings may add yellow jewels to intrigue the wearer. The most popular gemstone for engagement rings is diamond. 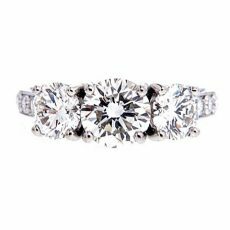 This is partly from centuries of tradition which connect diamond’s hardness with steadfast love. Twentieth century campaigns highlighted the connection between the jewel and romance. Engraving is a decorative technique used in metalwork, jewelry and other fields. It creates images and words by cutting negative space into a piece. The practice is ancient, with engraved jewels dating to the Roman empire. Diamond engagement rings and wedding bands carry special meaning for their wearers. All represent a lasting relationship, but many want more from their rings. What Makes a Ring Pretty? Engagement rings, wedding bands and anniversary rings have common elements. They’re made of precious metal, adorned with diamonds and come in many designs. People looking for diamond rings want something attractive, but may have trouble figuring out what that means. What connoisseurs find beautiful varies. There are many rings made with women in mind, and some for men. Some people may be uncomfortable with the idea of gender specific designs. 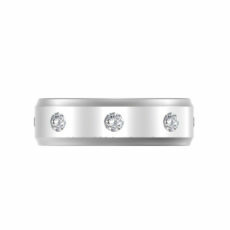 For them, there are diamond bands anyone would be happy to wear. These can have one stone or many, but are always attractive. 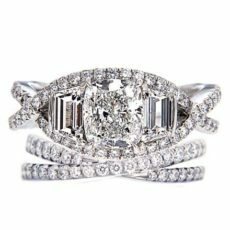 The diamond bands of your dreams pass through many steps before they come to you. 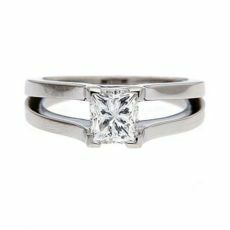 Diamond engagement rings, wedding bands and anniversary rings form with the help of experienced hands. These symbols of love and commitment take skill and several specialties to accomplish. 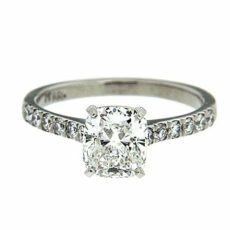 One of the distinctive features of diamond rings is how they reflect light. Diamonds have a luster so unique, it’s named after the stone. 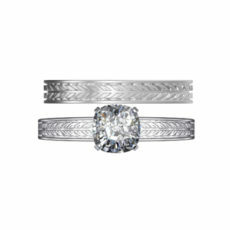 The precious metal that makes the rest of the ring can be as bright or textured as the designer wishes. For both materials, surface shine depends on the finish. 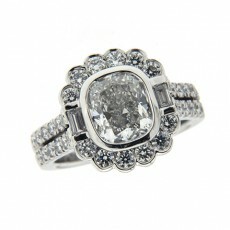 Diamonds are a popular element to engagement rings and wedding bands. They’re admired for their brilliance, durability and symbolism. While the rings themselves get recognition, they’re often overshadowed by jewels. There’s plenty of variety to be had with band designs, including the shapes they take on. While diamonds are appreciated in their own right, gem quality stones are commonly affixed to precious metal and worn as jewelry. 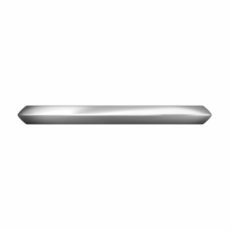 Setting types may vary according to the overall design, or even the type of jewelry. Some mountings are quite popular, each with their own aesthetics. 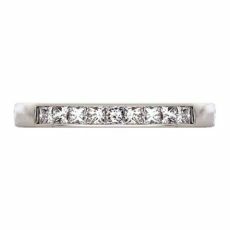 Diamond bands are the top choice for engagement rings, wedding bands and anniversary rings. Those who want something different might add colored stones to their rings. 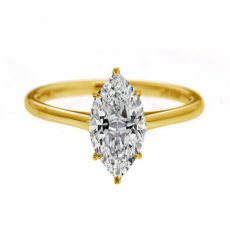 The stones may have special meaning to the wearer, or be used to offset the diamonds. No matter the reason, there are many options to choose from. Diamonds are the most popular jewel for engagement rings, wedding bands and anniversary rings. They’re brilliant, durable and represent an enduring relationship. 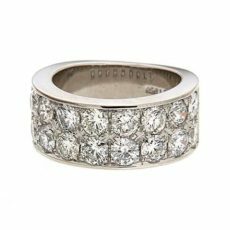 Diamond bands are not a monolith. There are engagement rings, wedding bands and anniversary rings. They’re made from a variety of precious metals and mounted with different diamond cuts. While some diamond rings are left plain, others are decorated, or made with certain motifs in mind. 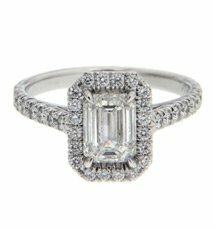 The diamonds in engagement rings and wedding bands are more than gorgeous. They represent love and an enduring relationship. Though the jewels are quite hard, they aren’t impervious. Some people find their perfect diamond engagement rings in one fell swoop. 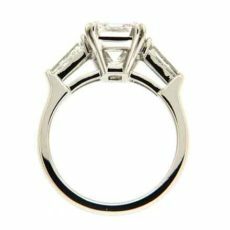 Others may find their ideal rings piecemeal, selecting the bands, metals and more. Still more might want to change their existing rings. 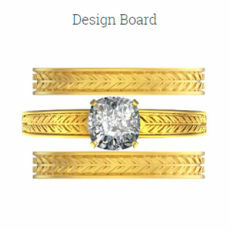 A new custom for engagements and weddings is to buy both rings at once. It’s also becoming popular to buy coordinating engagement and wedding bands. Color, clarity and the way they interact with light are key elements of diamond’s beauty. Diamonds come in a range of hues, each lighter than the last. Clarity studies the diamond crystal and its quirks. 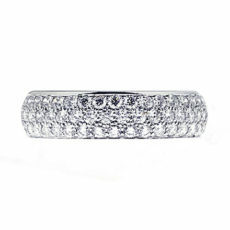 Eternity bands are rings that contain a wealth of diamonds, enough to encircle the entire band. The diamonds are of the same size and cut, creating a ring that looks the same no matter which direction it’s turned. 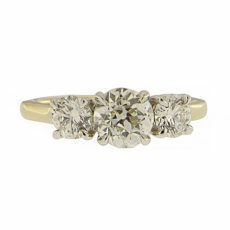 Three stone rings, also known as trinity or trilogy rings, are associated with love and marriage. The symbolism of the rings may vary according to the wearer. The tradition of wearing a ring to commemorate one’s marriage is an ancient one. Ancient Egyptians are believed to have originated the tradition, though the practice has been confirmed to happen in the Roman Empire. Round brilliant cut diamonds get their name from their shape and the way they reflect light. They’re the culmination of years of research how to unlock the most brilliance from the jewel. 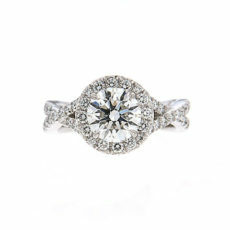 The stone has been a favorite ever since, and is the top choice for diamond engagement rings. 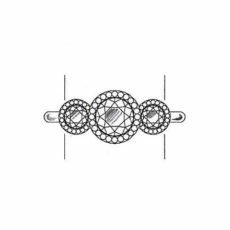 Diamonds are beautiful, but how they’re placed in the ring influences their appearance. An ideal setting keeps the jewel secure, preventing it from rubbing against and damaging other stones. A good mount also keeps diamonds safe from chipping, while allowing light into the jewel to showcase its cut and clarity. 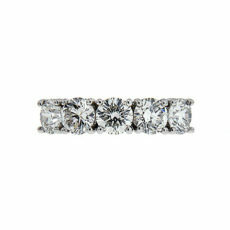 Most people looking for diamond bands don’t have the time to study diamonds in detail. Between shapes, cuts, settings and designs, searching for a ring can feel overwhelming. There are ways to make sure you’re getting the gemstone quality you want. Knowing some of the basics may make your shopping experience easier. “Guard rings” refers to two kinds of bands. One is a split shank large enough for a second ring to fit inside. 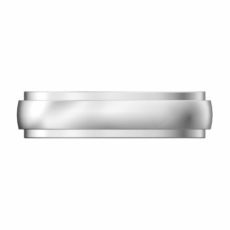 The other is a slim metal band placed above the ring it protects. It’s unknown when and where guard rings originated, but they serve a valuable purpose. 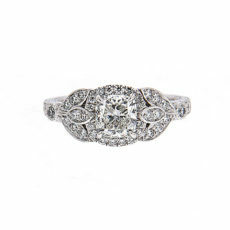 Since their debut in 1919, round brilliant cut diamonds have been quite popular, gracing countless diamond bands. Mixed cut diamonds, which blend brilliance with weight retention, are also favored by today’s connoisseurs. There are many customs surrounding wedding bands. One is where both partners wear rings after marriage. Another is wearing your band over your diamond engagement ring. Most everyone wants a ring they are happy to wear every day. Centuries ago, couples received gifts of silver or gold to honor milestone anniversaries together. As time passed, more people felt that every year together was worth celebrating. These occasions are marked with cards, evenings out, and even diamond anniversary bands. Diamond rings are a versatile accessory, suitable for dressing up a casual outfit, commemorating a wedding, and durable enough to be worn every day. Some diamond rings, be it thorough their color, carat, design or owners, are spectacular enough to be named. Diamond grading is when a jewel is evaluated to determine its characteristics. Trained gemologists examine stones to gauge traits such as carat. 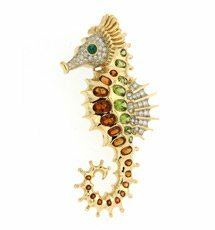 They also note features which help the gemstone stand out from others. The Four Cs outline the major aspects of diamond quality. 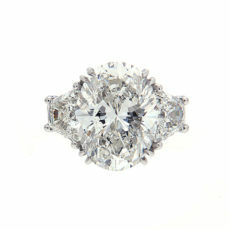 Out of carat, color, clarity and cut, the last is the most complex to evaluate. Cut doesn’t only determine the shape of diamonds. 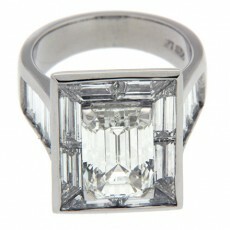 The level of brilliance and fire in the stone depends on the quality of the cut. 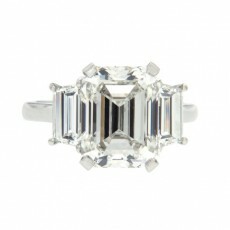 This in turn influences how the final diamond engagement ring will look. Weddings can feel like the ultimate expression of love. Many traditions arose to honor the occasion. 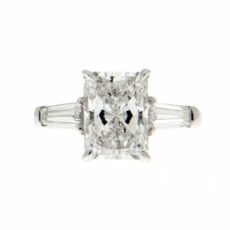 Engagements, or agreeing to marry, are commemorated with diamond engagement rings. At the marriage ceremony, wedding bands are exchanged between the couple to mark the next step in their relationship. After a couple marries, one or both wear rings to commemorate the change in their relationship. Wedding bands are an ancient tradition said to be thousands of years old. Over time, what they look like and what they’re made from has changed. From simple materials to precious metals, puzzles to diamond studded confections, one thing remains the same. 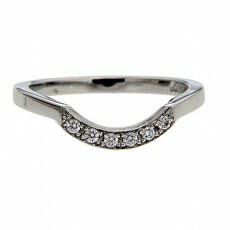 Pave settings use miniscule diamonds to cover portions of a ring. These stones are set close together to create the impression of jewelry paved with diamonds. A fraction of a carat gives diamond rings an air of luxury. 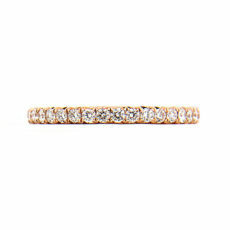 Their brilliance makes pave diamond bands popular as wedding and anniversary bands. As wedding bands mark a turning point in a couple’s life, anniversary rings commemorate the years together. While tradition names certain gifts to mark specific anniversaries, today’s couples give rings any year they choose. 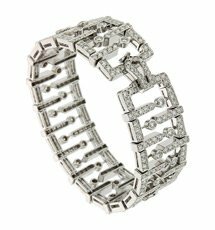 Diamond anniversary bands are popular, due to the jewel’s beauty and connection with love. 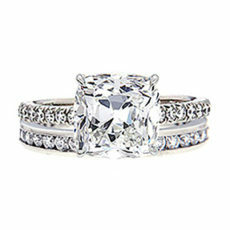 Depending on the era and the individual, tone on tone diamond rings are the jewelry of choice. 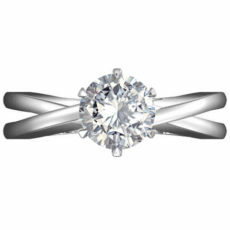 Platinum or white gold engagement rings provide cool tints and neutral colors which appeal to many. Art Deco is an aesthetic that was popular during the 1920, 30s and 40s. It celebrated modernity and innovation, while featuring influences of ancient Greece, Rome and Egypt. Many Art Deco creations are geometric, favoring straight lines and sharp angles. 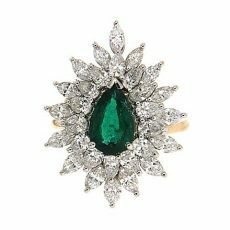 The Edwardian period, which ranged from 1901 to 1910, was known for its luxurious jewelry. 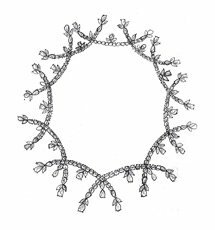 Garland motifs that emulated flower wreaths were in style, as was lacy openwork designs, bow jewelry that resembled ribbons, and other looks that promoted fluid lines. The custom of wearing rings to mark an engagement is quite old, dating back thousands of years. 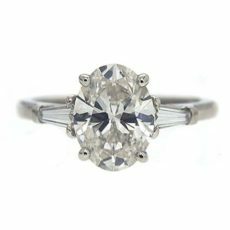 Mounting diamonds onto engagement rings is another long tradition, with its roots in the early Renaissance. Today’s people still commemorate their weddings-to-be with bands, though the details are always changing. 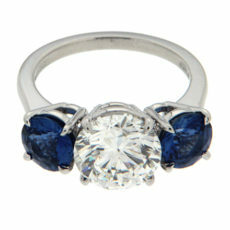 While some styles of ring became timeless classics, others have come in and out of popularity over the centuries. Designs vary by trend, culture and symbolism. Bands can be worn purely for aesthetic reasons, showcasing pretty metalwork and gemstones. Others may denote allegiance, like class rings, or serve a utilitarian purpose, like container rings. After a couple agrees to marry, they exchange engagement rings. Some are plain, though most have diamonds. Both kinds are worn daily as a sign of love and commitment. While their appearance has changed over the centuries, their meaning remains the same.